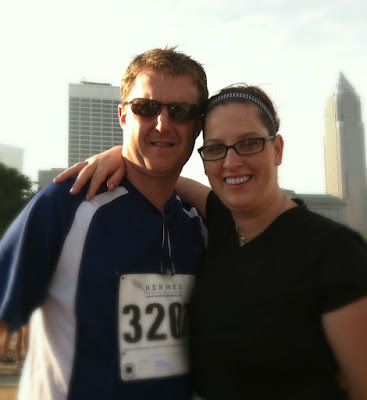 This weekend my husband and I ran the OROC race. 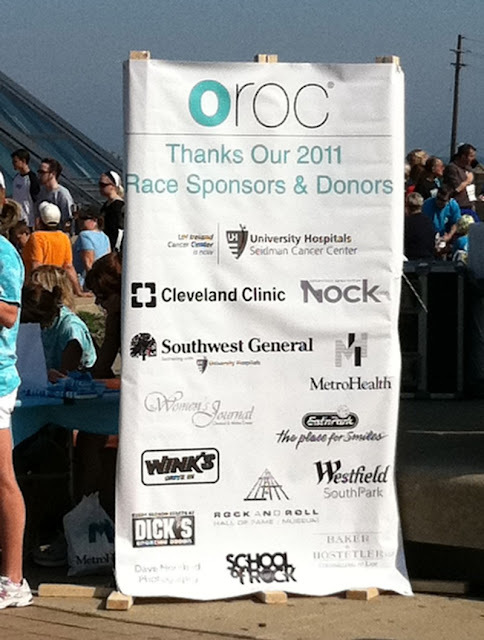 OROC stands for Outrun Ovarian Cancer. It was an important race for me because my my mother-in-law is an Ovarian Cancer survivor. It was an amazing race with so many amazing people. 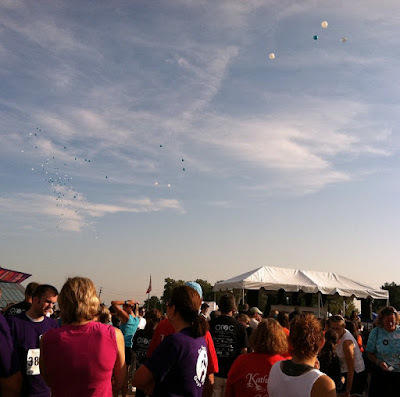 Balloons were released in honor of the survivors and in memory of those we lost throughout the years, There was of course not a dry eye in the house. The race started and it was so cool to see massive sea of Teal. I had no idea that teal was the color, and I sort of felt like a trader in pink. Hubsters and I were ready to race. As we were waiting my friend told me she had to get ready to cheer on her son at the top of the hill. I kind of freaked out, I mean I totally don't do hills. Seriously I am running with all these amazing women who have lost loved ones from Ovarian cancer, Survived it, and I am freaking out about a darn hill. What a wimp. My husband snapped a picture of me crossing the finish line. I did the race in 39:23! I finally broke the forty minute mark this year which for me is HUGE! I am a slow runner, I always was and I always will be but hey someone has to come in last (I totally want to create a T-shirt that says that on the back). I did not place (I actually came in 705th place...lol) and I probably never will, but I beat 40 minutes which was my goal from the start so I am good with it. Next up will probably be the Race for the Cure, where my pink will actually work quite well!